Thoughts of a cynical idealist: Faces speak louder than words. This is my family. Examples of how faces can say so much to people who know them. These faces are part of my life, and part of what makes me me. I love this photo as it captures so much unsaid stuff that goes on in my family. At the back there is Mark, grinning smile masking the slightly uncertain wary look in his eyes, the questioning 'what is she doing now?'. 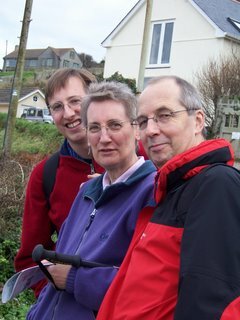 Then Mum and Dad, Mum on the verge of telling me not to be so silly, and Dad bemused as ever by the randomness of his daughter. I love the fact that a simple action, like me taking a photo of them, sparks off this reaction in their eyes and faces. All because I have told them to do something strange like, "Smile for the camera".